SilcSkin facial pads were designed to reduce existing wrinkles and expression lines and prevent new ones from forming.Worn while sleeping, the pads relax and retrain the facial muscles and soften fine lines and wrinkles. SilcSkin Facial Pads are made of 100% clear medical grade silicone. No additives, fillers, latex or adhesives are used. Pads may be washed without losing their adhesive quality. Pads usually last 30 days depending on usage time and skin conditions. 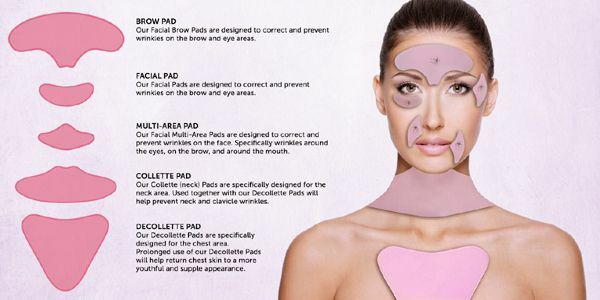 Our Facial Pads are composed of 100% Medical Grade Silicone. Electro static energy provided by the pads when worn is supposed to improve the irregular collagen structure and also creates an increased blood flow which results in an improved skin tone. Silicone should contribute to moisturizing the skin by drawing the skin’s moisture to the surface. This process has been shown to hydrate the skin and is an important factor in healing scars. We are simply treating wrinkles as scars by hydrating, improving the Collagen structure, and flattening them out. Prolonged use will help return Face skin to a more youthful and supple appearance, by softening fine lines and wrinkles.